Summer is almost here...and do you know what that means? Mangoes are in season again! And yes, that makes my family and I sooooo happy! We love mangoes, you know. Though we enjoy eating it plain, we also love savouring this delicious fruit in different forms. We love making salad, ice cream, milk shakes and ice candy with it. Indeed, the wonderful taste of ripe mangoes never fail to amaze our taste buds. Mango Cake has always been my favorite. Same with Ryan. When we were still in the Philippines, birthday celebrations and other special occasions won't be complete without Red Ribbon Bakeshop's Mango Cake --- a white chiffon cake layered with light mango cream filling and frosting with real mango bits, topped with fresh mango slices. The fact that I miss it badly inspired me to make this cake the other day. 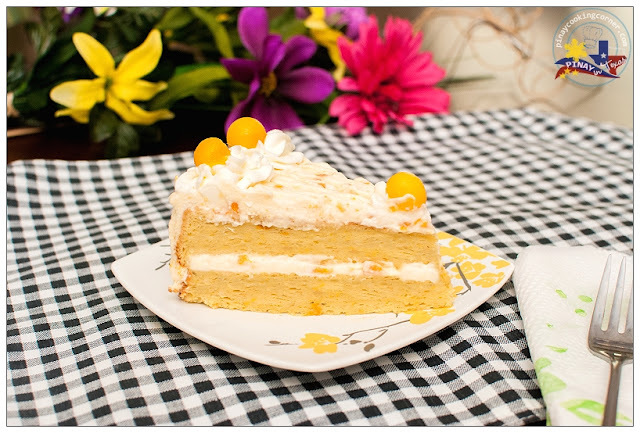 Instead of a regular chiffon cake, I thought of tweaking the recipe in my Goldilocks Bakebook to make a chiffon mango cake. Mango overload you might think! Well, I tell you, the outcome was so good that the cake was gone in no time. Ryan and the girls loved it so much...and of course, I did too! The cake was so soft and mango-eey...and the mango cream frosting was amazing. It has the right amount of sweetness that complements the cake so well! For the mango lovers out there, this is for you...You should definitely try it! In a blender combine all ingredients and process to a smooth puree, about 30 seconds. Strain through a fine metal sieve set over a bowl. Use a rubber spatula to stir and press the puree through the sieve. Discard solids. 1. Preheat the oven to 350F. Lightly grease two 9" round baking pans and then line with parchment paper. 2. Sift cake flour, baking powder and salt in a bowl. Set aside. 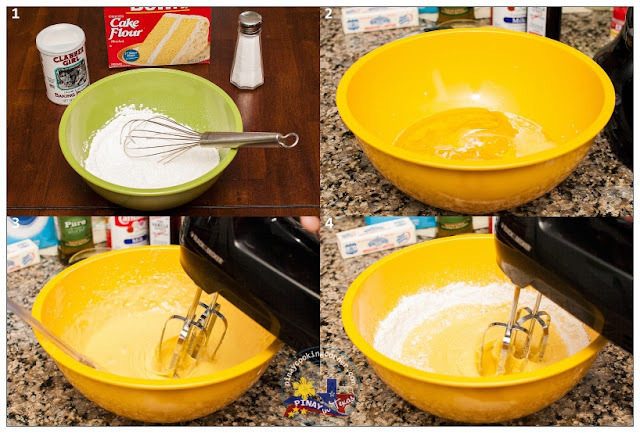 In another bowl, combine egg yolks, ¼ cup sugar, vanilla extract, evap milk, mango puree, olive oil and butter in a bowl. Mix at low speed until well blended. Slowly add dry ingredients and mix until batter is smooth. 3. 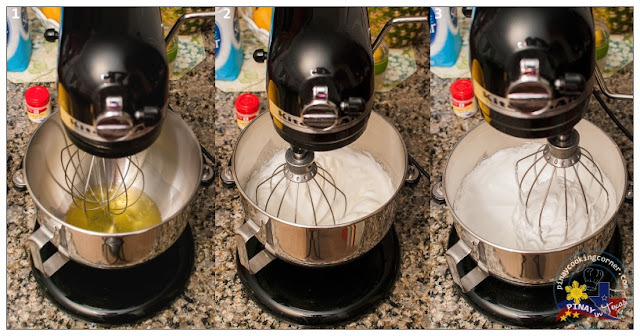 Beat egg whites and cream of tartar at low speed until it forms soft peaks. Slowly add remaining sugar and continue beating at medium speed until stiff peaks form. 4. 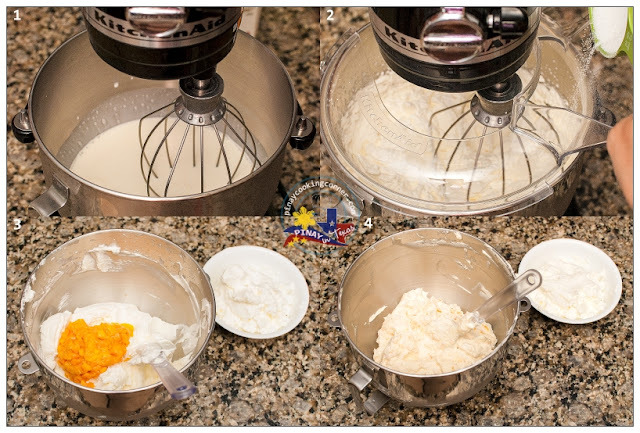 Fold beaten egg whites and mango bits in batter until well combined. Transfer to prepared pans and bake in preheated oven for 20-25 minutes or until a toothpick inserted in the middle of the cake comes out clean. Allow to cool down in the oven with the oven door slightly opened for about 15 minutes to avoid sinking. Remove from oven and allow to cool down in pan for 10 minutes before transferring onto wire racks to cool down completely. In a bowl, whisk heavy whipping cream until soft peaks form. Slowly add sugar and whisk some more until stiff peaks form. Separate about 1 1/2 cups of whipped cream for border. Fold in the mango bits and mango puree into the remaining cream. Store in the refrigerator until ready to use. Place one cake on a serving plate or cake stand. Spread about ¾ cup of mango cream. 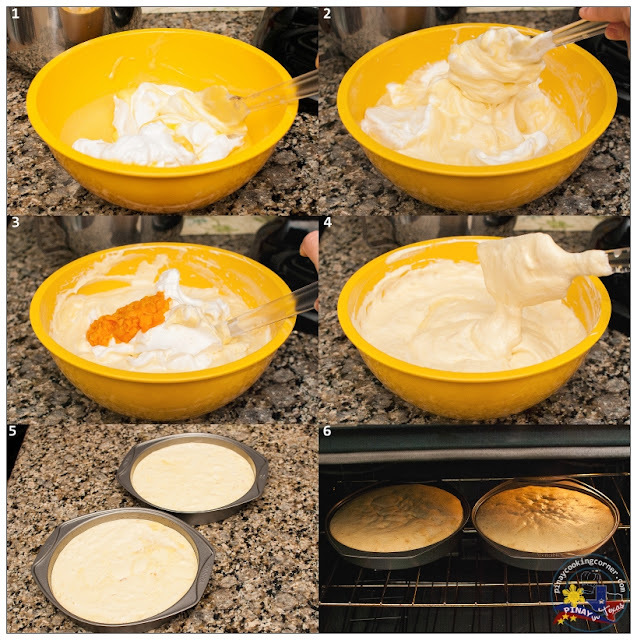 Put second cake on top then frost the whole cake with the remaining mango cream. 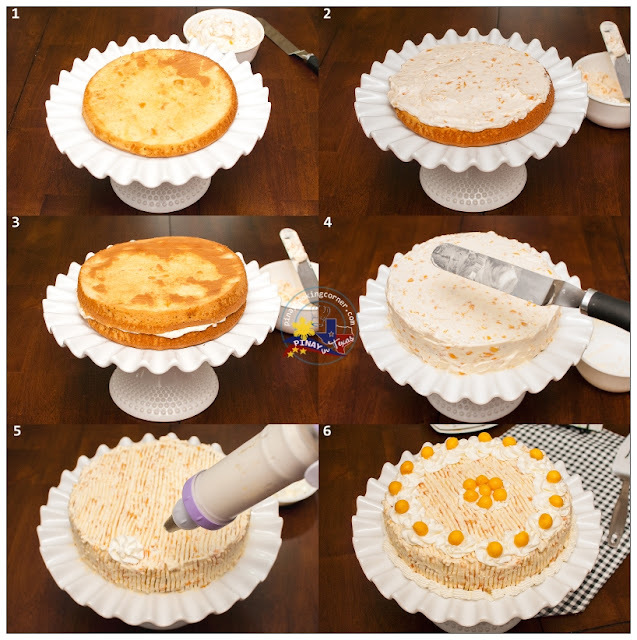 Apply cake border on top and base of the cake using the reserved whipped cream. Arrange mango slices/balls as desired. Chill for at least 30 minutes before serving. Mango cake looks delicious love that frosting Tina. I don't think even Red Ribbon's can compare with this. It looks so yummy I'm literally drooling! 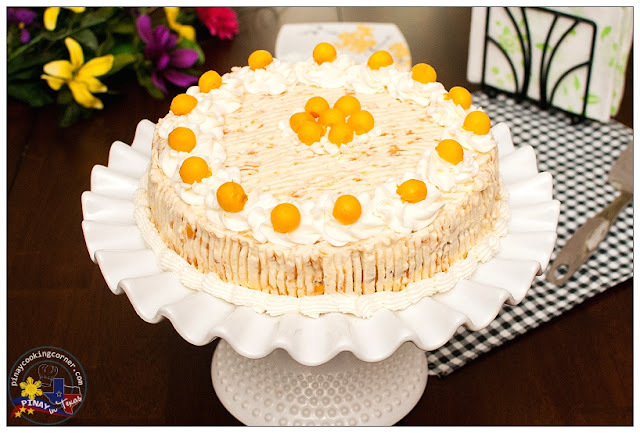 This looks so yummy.was googling last week to find recipe which includes mangos puree in the cake. 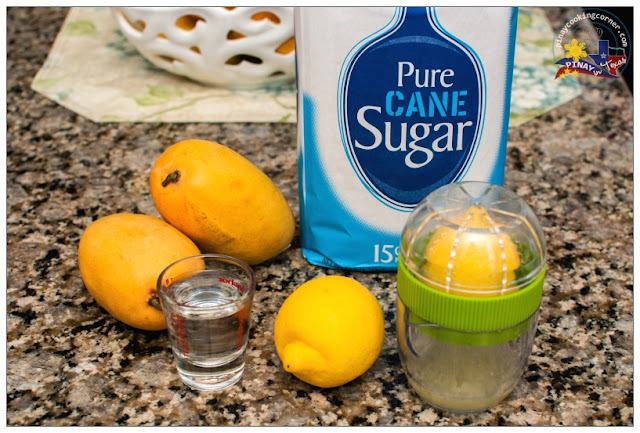 I will have to try this next time I have some mangoes to use up or get a good deal on some! I love cakes that have fruit juice or flavor in some way added- so this was a great adaptation! Plus it is so pretty! I need a slice , please ? That mango cake looks delish , Tina ! I love everything with mango! Your cake looks amazing! Oh Tina, this cake looks beautiful and I love mango. What a stunner cake esp since I love mangoes!! Hi Tina! I wish I could taste your cake. it looks so delicious. Do you have Philippine mangoes there? Missing the mango overload back home. 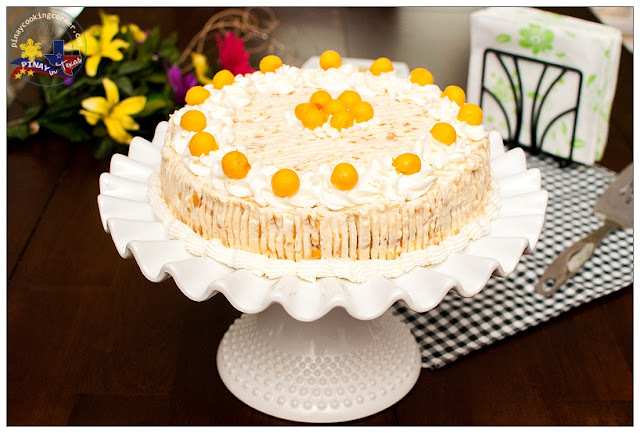 Hi Tina, I came across your blog because I was searching for goldilocks mango cake recipe (it's my sister's favorite and her birthday is coming up). You mentioned that you modified the recipe would be possible if you would list what the original recipe calls for? Thank you so much, I look forward to trying the original as well as your version. Thanks again. The recipe from Goldilocks Bakebook is for plain vanilla chiffon cake. In that recipe, there's no mango puree and fresh ripe mango bits in the cake. 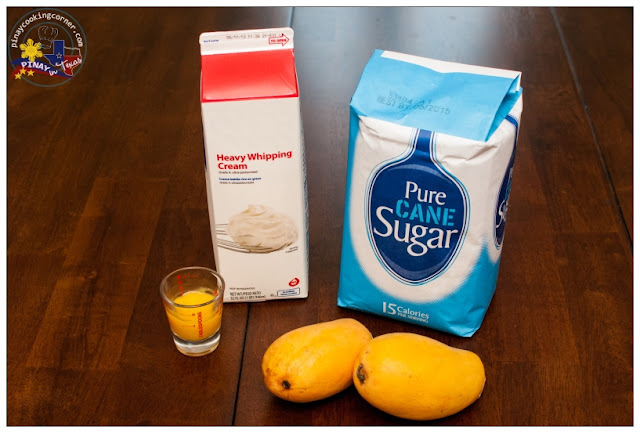 The rest of the cake ingredients are the same, just add 1/2 cup water to replace the mango puree. If you want a copy of the complete recipe from Goldilock's Bakebook, you can PM me your email add, and I will gladly send you a photo of the recipe page. i want to make only 1 cake. 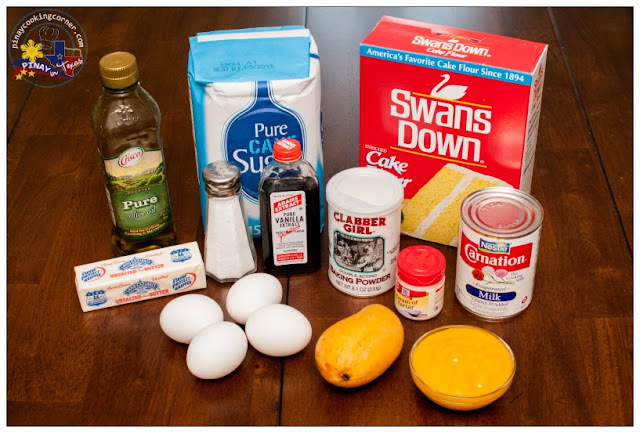 Can you give me the measure for the ingredients to make 1 cake? Sorry but I haven't done this with just a single layer, but I guess it will be safe to reduce all the ingredients to half if you want to make just one cake. I tried making this recipe and it turned out to be great. The perfect desert for summer here in the Philippines. Thanks for sharing this lovely recipe. Awesome! looks sooo delicious.... I will try and make this on Father's Day for my husband. He love's Mango cake. Thanks for sharing.